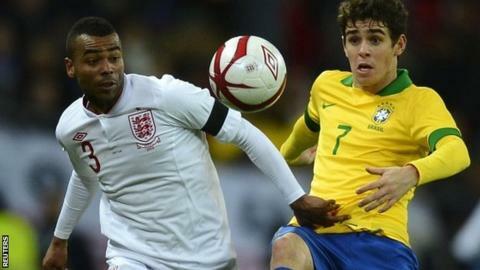 England left-back Ashley Cole said he was moved by the reception he received after earning his 100th cap as England gained a rare win over Brazil. Cole, 32, became the seventh England player to pass that mark but was taken off with a tight hamstring at half-time at Wembley. He said: "I was [emotional]. I'd like to thank the fans, because I didn't really expect the reception I got. "It was very nice. I'm delighted and overwhelmed. I'm kind of speechless." The Chelsea defender was replaced by Leighton Baines at the break and told BBC Radio 5 live: "It's not a big injury, it's a bit of a bad back and a tight hamstring." At that stage, Wayne Rooney's goal had given England a 1-0 lead following Ronaldinho's missed penalty. Fred equalised three minutes after the interval, but Cole's Chelsea team-mate Frank Lampard earned England their first win over Brazil in 23 years with a curling strike on the hour mark. Cole singled out Jack Wilshere for special praise as the Arsenal midfielder had an impressive game at Wembley, helping to create Rooney's opener. The full-back also said Chelsea would miss Lampard, should the Champions League winners fail to offer him a new contract at the end of the season. Commenting on Lampard's winner, Cole said: "I see this week in, week out. He came off the bench and he's still scoring goals. He's a fantastic player and good to have in the team. "You don't want to lose big players like that, but it's not down to me. Certainly as a player, as a man and someone being around the squad, we are going to miss him." Cole, who joins Peter Shilton, David Beckham, Bobby Moore, Bobby Charlton, Billy Wright and Steven Gerrard in England's 100-cap club, added: "I got so many text messages from ex-team-mates, ex-managers and current players I play with now. "It was nice to have my mum and brother and all my friends here, it was a great night for me. "To beat Brazil at home in a packed stadium and in the way we did, we had some great performances. Jack Wilshere was amazing and has been impressive all season since he came back from injury. "It's been hard growing up the way I did. I never thought I would get to this stage in my career and in my life, so I'm very happy with what I achieved."